On Monday I mentioned that some of my students in my Cut & Shuffle class made extra blocks. I was able to make a few more and set them together at Sew Me STL for a quilt top for our Project Linus drive, due in November. I needed batting and I hadn't figured out what I would do for backing, probably cobble something together from stash. I needed more Kona Bone for another project, so I went to the chain store where I had gotten it before, and found that they had fleece on sale. Backing problem and batting issue solved. 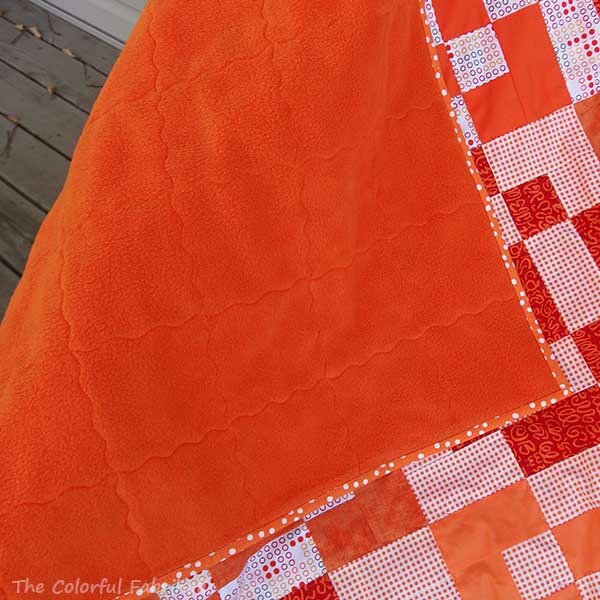 I backed the donation quilt with orange fleece and didn't use any batting at all. I quilted it with the walking foot, using a serpentine stitch over the seams. Enough to hold it together, but still leave it soft and drapey. Yes, I know this technically doesn't meet the definition of a quilt, but for this purpose, who cares? It feels so soft and snuggly, some kid is going to love it! 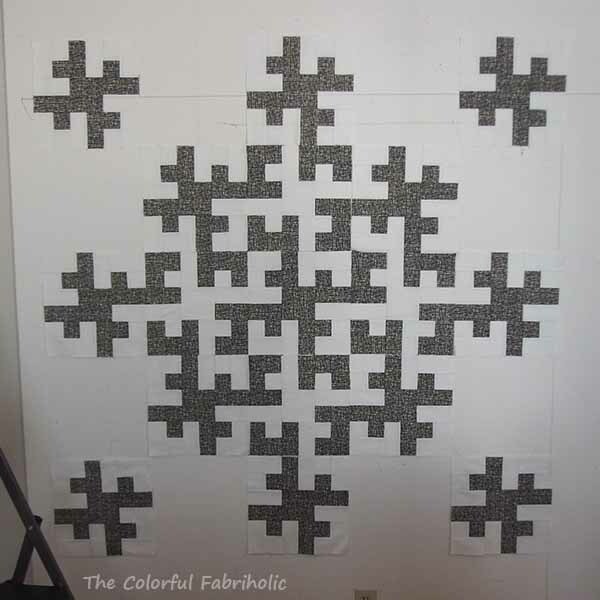 I really like this and may use this method for kid donation quilts in the future. The cost of the fleece is far less than the cost of batting and backing fabric. And the snuggly, cuddly feeling will be more comforting to kids. So, a Friday finish this week. Whoo-hoo! I'm linking up with Confessions of a Fabric Addict and Crazy Mom Quilts. Hmm, I like the feel of this, with only the fleece backing and no batting, so much that I think I'll make a lap quilt for my dad for in his wheelchair. 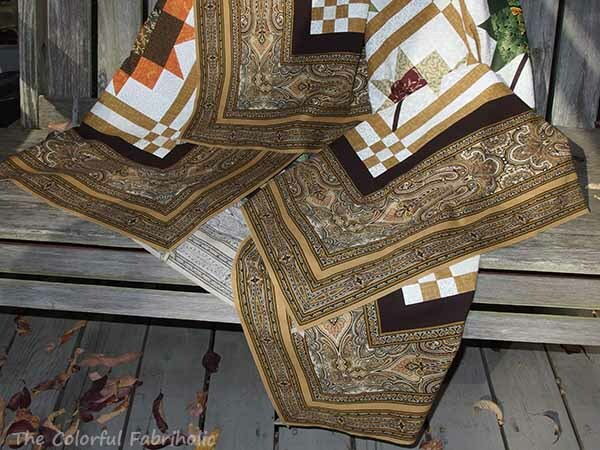 I made him a fidget quilt last year, and something like this soft "blankie" might be nice for him. 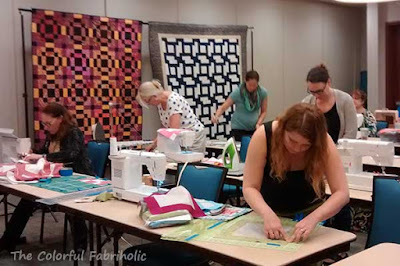 I had so much fun at Sew Me STL this weekend! Sew Me STL is the annual weekend retreat of the St. Louis Modern Quilt Guild. For me, it started with my Cut and Shuffle Workshop on Saturday morning. There were 14 students in my class and they were all awesome! 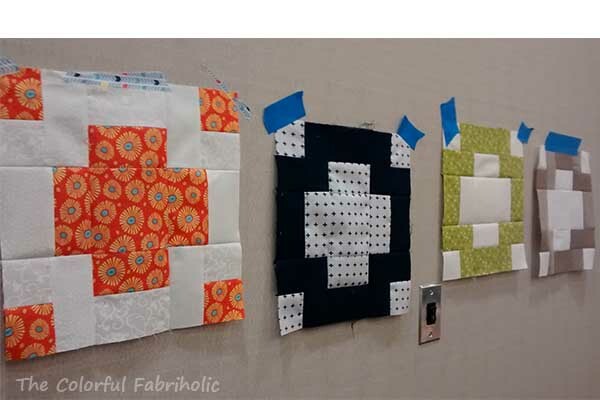 We made three of the blocks from Cut and Shuffle Quilts. We started by making Block Mamas, then marked cutting mats for accuracy, cut and shuffled block parts, and assembled the blocks. Everyone was so focused! They all got their cutting mats marked with tape to assure that they cut their Block Mamas apart correctly. Then they all went to town making blocks. We started with the Plus Block. Everyone seemed to get into making blocks this way, using the Cut and Shuffle method. After the Plus Block, we made Four Corners blocks. And then Labyrinth blocks. Some people even went on to make additional blocks; I showed them how the shuffled parts can make a Hashtag block, and the Antler Dance block I'm currently working with. By the end of the workshop nearly everyone had finished their class blocks. 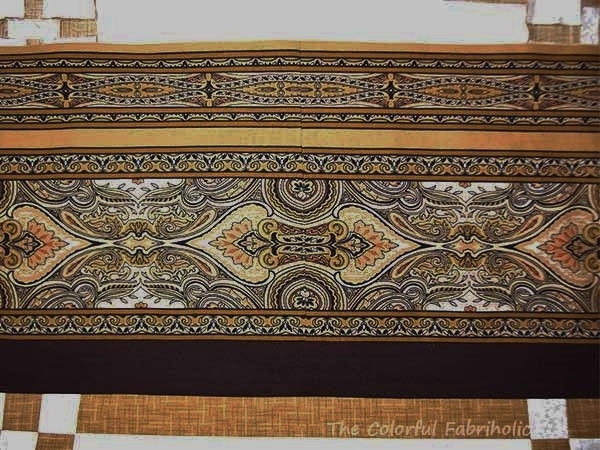 We talked about fabrics a little bit. My cut parts sample had a directional print and I showed them how to mix it up so the print would go in different directions in the finished block. We talked about value and contrast, and how greater contrast makes the block shape more apparent and how similar values make the contrast much more subtle. At the end of class, I offered bonus kits to any student who wanted one, for them to make a Four Corners block during Sew Me STL. About half of the class took kits and made blocks, and I put them together into a top which I'll finish for our Project Linus drive. They did such a good job, all the blocks came out the right size and went together well. 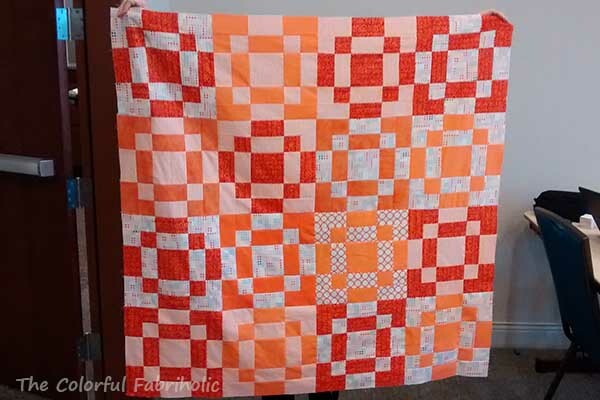 One of my students went on to make a whole set of blocks for another Project Linus quilt. She included the blocks from class, plus the Hashtag block. I can't begin to tell you how gratifying that feels, to have someone appreciate my blocks and method and class enough to go on to make more for such a worthy purpose. The rest of Sew Me STL was great, too. I sat with some of the members of my bee, and we worked on bee blocks. 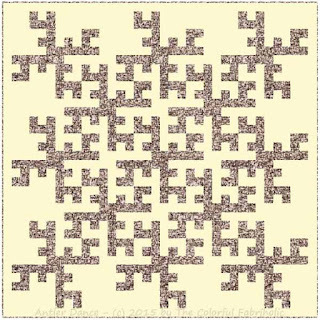 One of them was huge, and very difficult and confusing, not because of the block, but because of how the pattern was written. And some of us had only black & white copies of the directions. Thank goodness Marie had figured it out and coached the rest of us through the process! We got several blocks done and Chrissy was able to sew them together. She's making a Moroccan Tile quilt for her newly decorated living room. Thanks, Marie, for your help! I was able to get my Antler Dance blocks sewn together and the top and bottom border made. 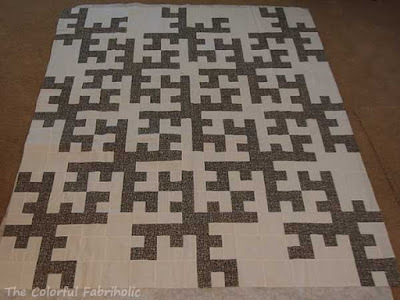 Then I discovered I didn't cut enough plain pieces for the border, and I'm out of fabric. No worries, it's Kona Bone which I bought locally in September so I can get more. 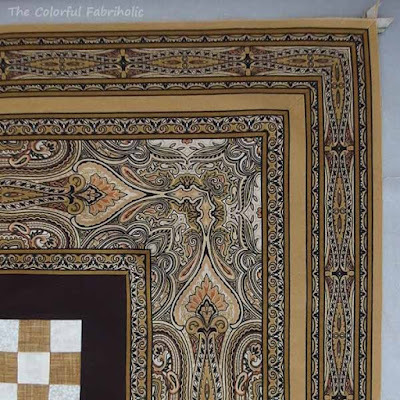 You can see how the borders finish the motifs. I was hoping to get the Antler Dance top finished so I could count the fabric out of my stash. Didn't happen, but I'll get more fabric and finish the top this week. I can, however, count out the fabrics for the bonus Cut and Shuffle kits because the Project Linus top is finished, so that's 2-1/2 yards out. It was really fun to hang out with my friends and sew all weekend. And - bonus! - I won a door prize: a print to frame for my sewing room, a thread catcher, and a big bundle of very colorful zippers (forgot to take a photo). I have to admit, when I got home yesterday, I was really tired! Now I have all my weekend chores to catch up on, so I'd better get off the computer and get going. The sooner I get them done, the sooner I can get back to sewing! 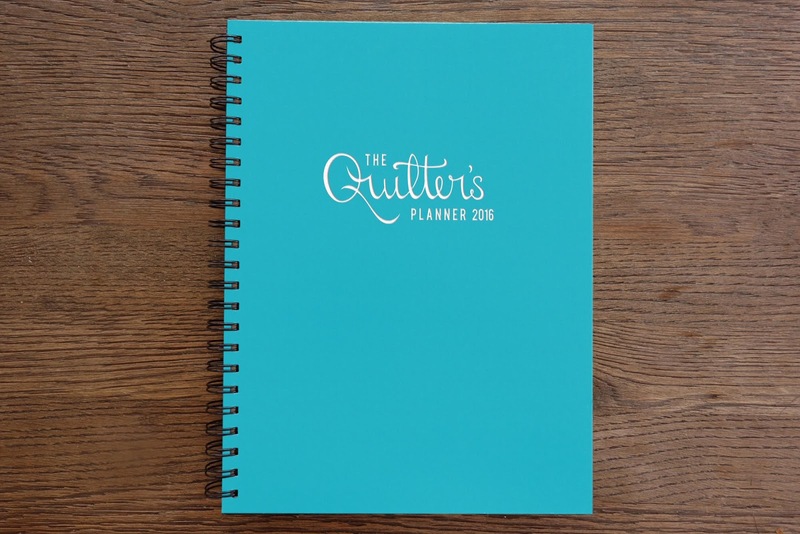 Today I want to give a big shout-out to Stephanie Palmer of Late Night Quilter, who is introducing her Quilter’s Planner. 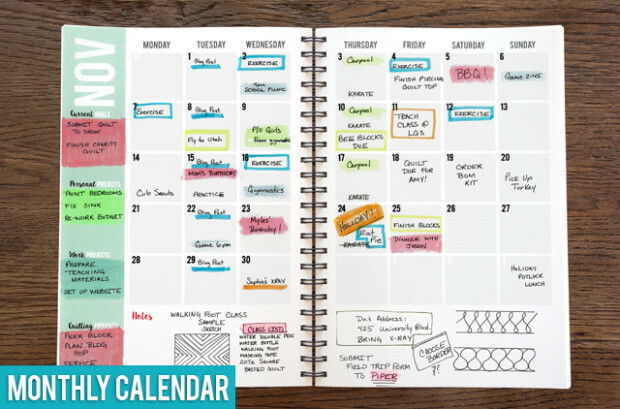 Stephanie launched her Indigogo campaign this week, featuring The Quilter’s Planner she developed to help us all stay organized and manage our lives and our projects. 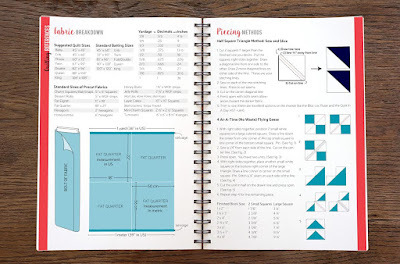 Approximately 8-1/2” by 11”, and spiral bound, The Quilter’s Planner is the one-stop, go-to indispensable aid to organizing the quilty life. To stay organized, I currently rely on a calendar, sticky notes, various to-do lists, a bulletin board in my sewing room and another in my kitchen, and my phone. 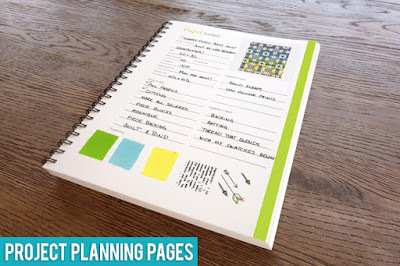 I’m so looking forward to being able to keep everything in one place using Stephanie’s planner. 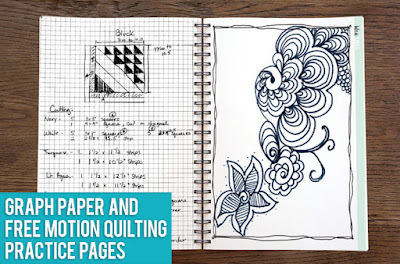 Like all planners, The Quilter’s Planner has weekly and monthly pages. But the features that make this planner special for quilters are the project planning pages, graph paper and free-motion sketching pages, and project status update pages. 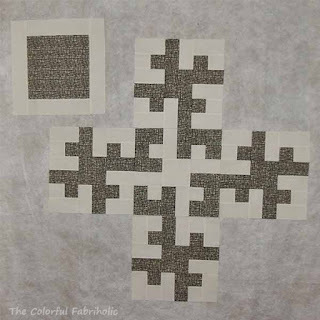 Even more special, Stephanie has included eight complete quilt patterns from talented designers. 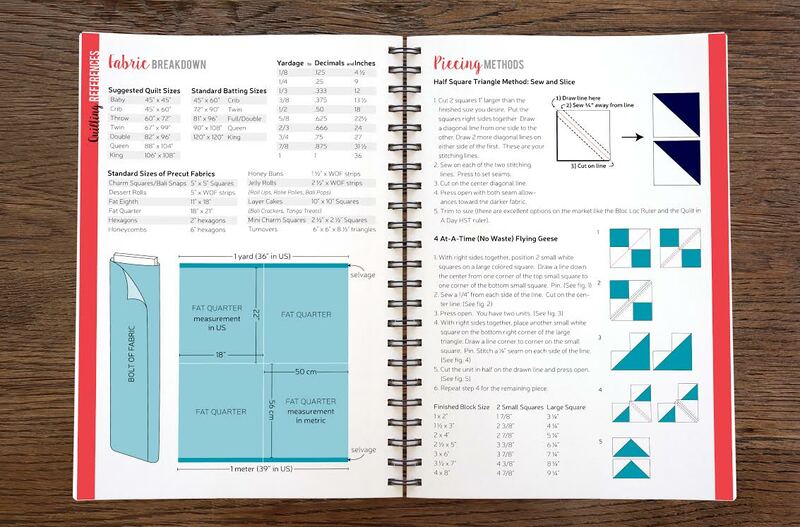 The planner also contains a reference section with important quilting measurements and construction techniques for common designs. 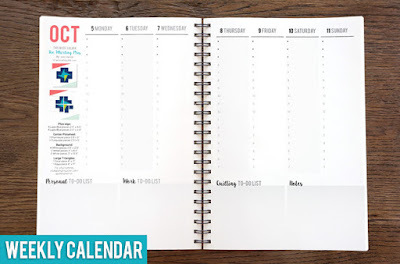 Weekly pages include space for to do lists for personal life, work, and quilting, plus notes. Each day features Stephanie’s “daily top three,” which she describes as the most important 3 things you need to get done to have a successful day. 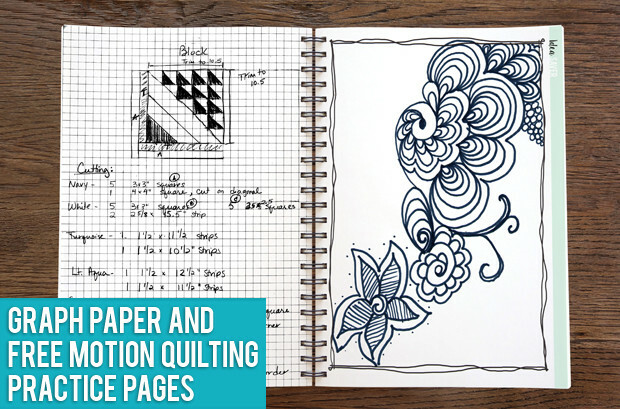 Each page features a quilt block designed by one of over 50 talented quilt bloggers. Monthly pages feature an at-a-glance overview of the month. Also helpful are spaces for personal, work, and quilting goals, and a roomy section for notes. Visit Stephanie’sIndiegogo site for more about her planner. Congrats, Stephanie, on your launch! I’m linking up with Whoop-Whoop Friday over at Confessions of a Fabric Addict because you deserve a big Whoop Whoop for this! Full disclosure: One of the blocks featured on the weekly pages is my design. 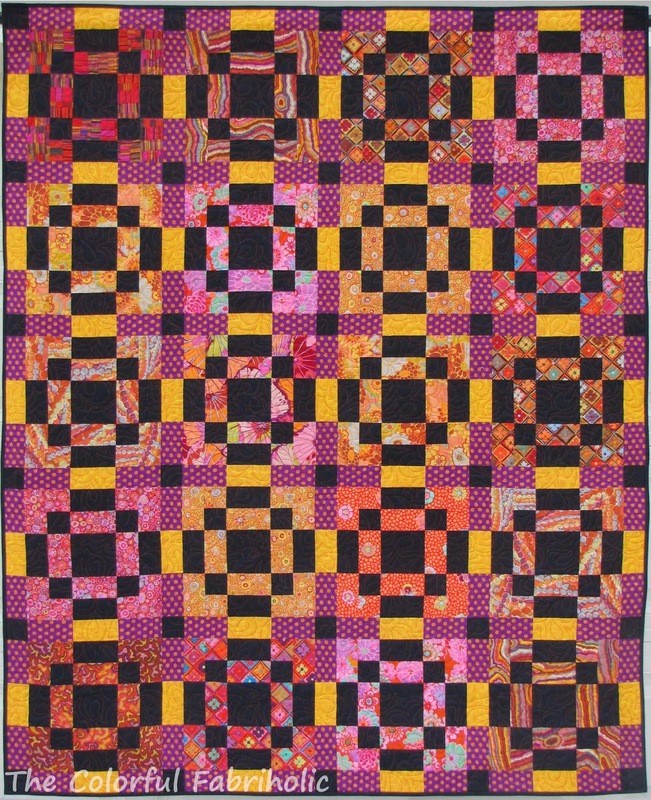 Also, Stephanie has graciously agreed to post about my book Cut and Shuffle Quilts in January (she's a little busy right now), and I'm happy to return the favor here. 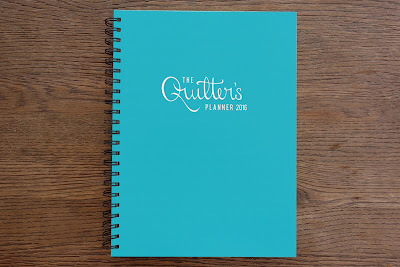 I'm looking forward to using The Quilter's Planner. My friend Sarah Craig at Confessions of a Fabric Addict posts book reviews on Wednesdays, and she very graciously agreed to review my new book Cut and Shuffle Quilts. Sarah speaks very kindly about my book - Thanks, Sarah! Go check out her post here. Sarah says she's intrigued with the versatile Block Mama method for making blocks, and she's added Heat Wave to her bucket list. 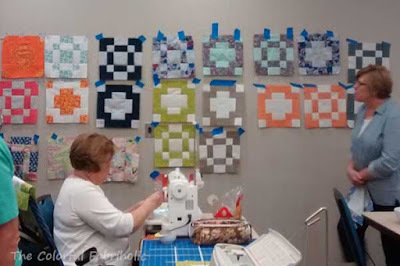 I like that she mentions how the blocks and quilts work in alternate colorways. 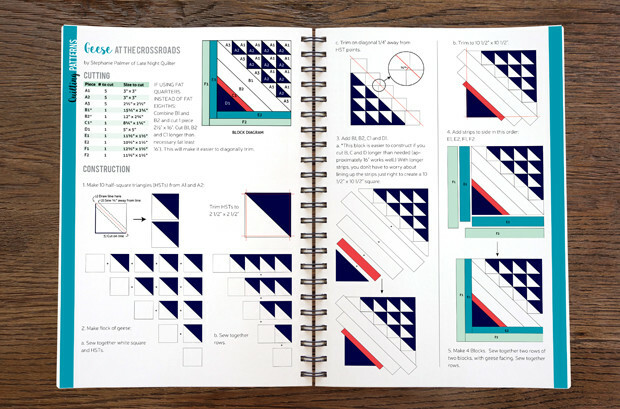 Four alternate colorways are shown for each quilt in the book. If you like the Disappearing Nine Patch, Disappearing Four Patch, and similar blocks, you'll love the Block Mama method presented in Cut and Shuffle Quilts. Thanks so much, Sarah, for so enthusiastically reviewing my book! 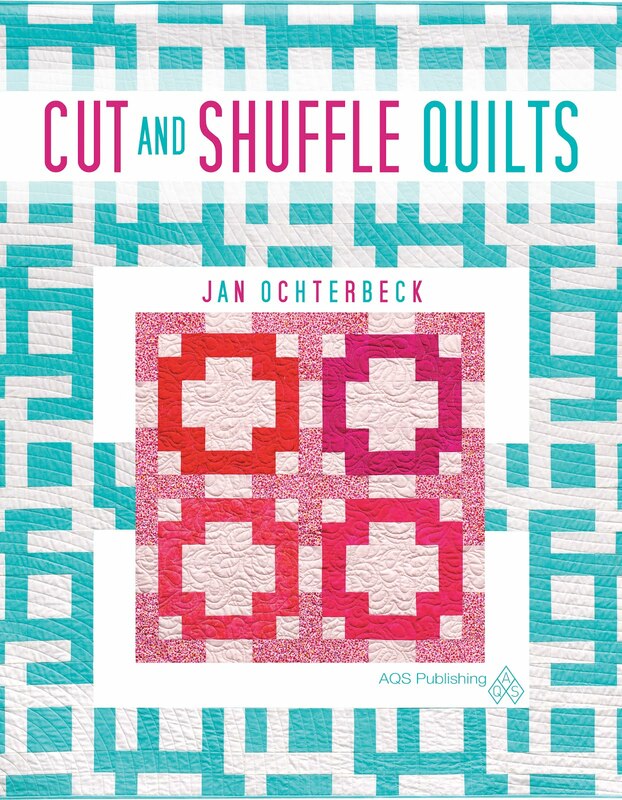 Cut and Shuffle Quilts is available from AQS or Amazon. I finished the rest of the Antler Dance blocks and added them to the wall, along with some of the parts for the border. I'll label the columns and rows and pack it up to assemble it at retreat this weekend. Hopefully this won't be a WIP much longer! 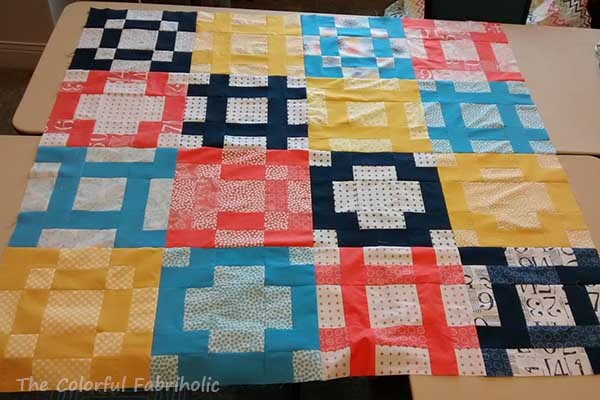 Linking up with Let's Bee Sewcial at Sew Fresh Quilts and WIP Wednesday at Freshly Pieced. 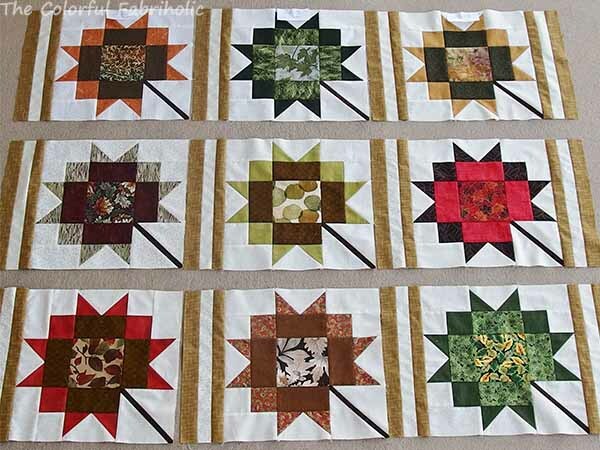 I hope to get the rest of the blocks done this week, and the parts for the border prepped. I want to take it to Sew Me STL (retreat) next weekend to finish assembling the top. Look at the center. 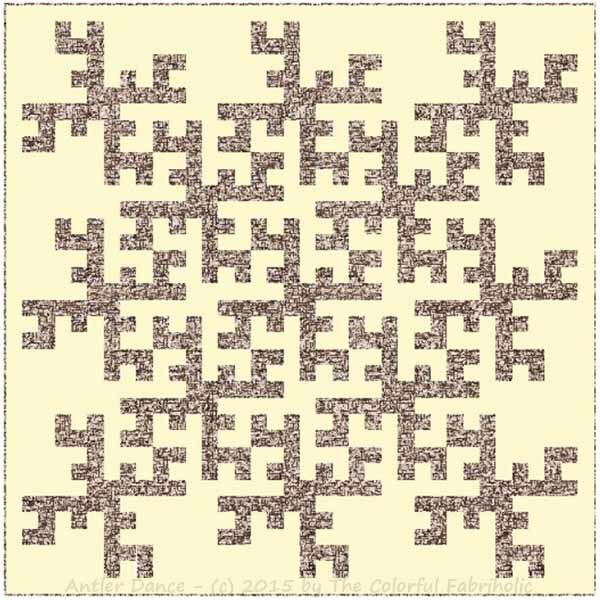 See how shapes that sort of look like stylized antlers rotate out in four directions? Hence the name Antler Dance. 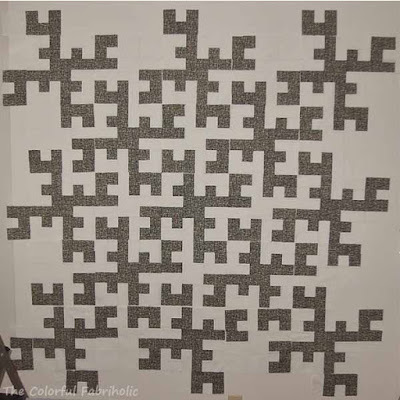 The missing blocks will complete the same tessellated motif and fill in the gaps. 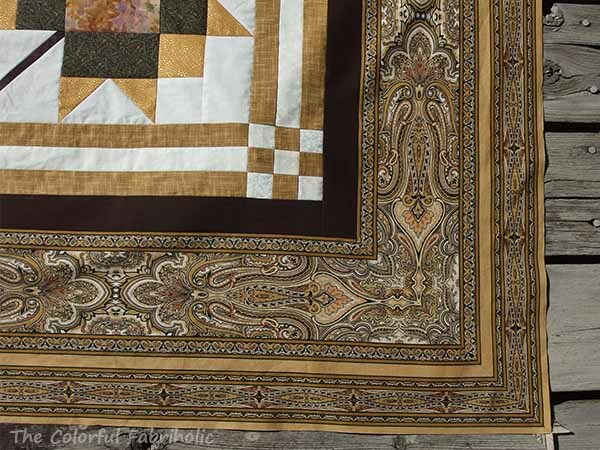 The border will complete the outermost antlers and frame the quilt, which will finish at 72" square. Not very colorful, but it's intended as a gift for an avid hunter and his family, so I chose focus fabric that sort of looks like miniature woodland camo and goes with their neutral décor. 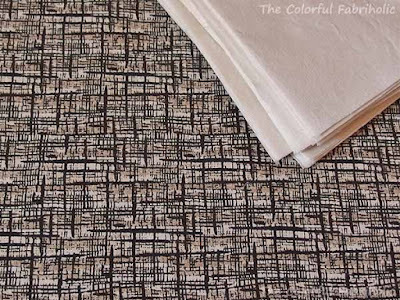 I love this fabric - I used it in Gramercy & Friends, too. I actually bought it two years ago with Antler Dance in mind, planning to use it and include the pattern in my book, but the editor had a smaller book in mind, so Antler Dance didn't make the cut. Seems like I've been alternating between colorful and neutral projects a lot lately. 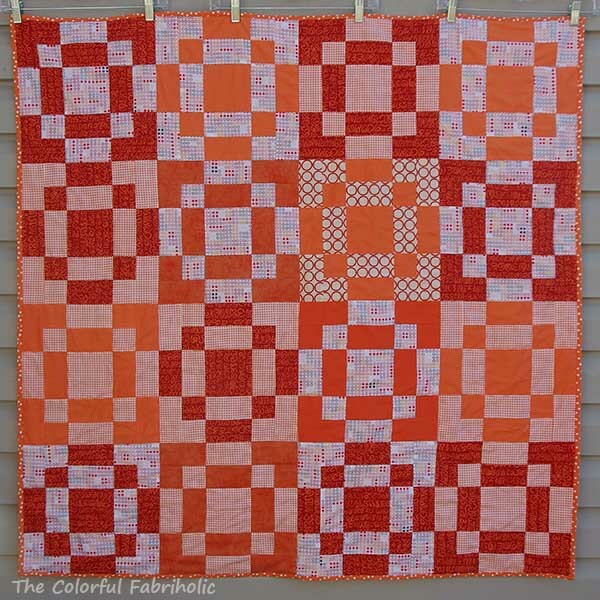 I'm cutting pieces for a quick donation quilt in bright pinks, oranges, etc. to have some mindless piecing to do at retreat. I always prefer to have something that doesn't take a lot of concentration. Hard to focus when you're socializing! Whoo-hoo! I get to count stash out this week! Since I finished the Maple Leaf Star flimsy, I get to count out the sashing and border fabrics. Can't count the blocks, they were BOM kits and I didn't count them in so I can't count them out. See previous post below for pics. This offsets the 3 yards of backing I got last week, and I'm still moving in the right direction. I'm hoping for more usage this month. We'll see. I'll tally the totals at the end of the month. Still hoping to break even for the year. 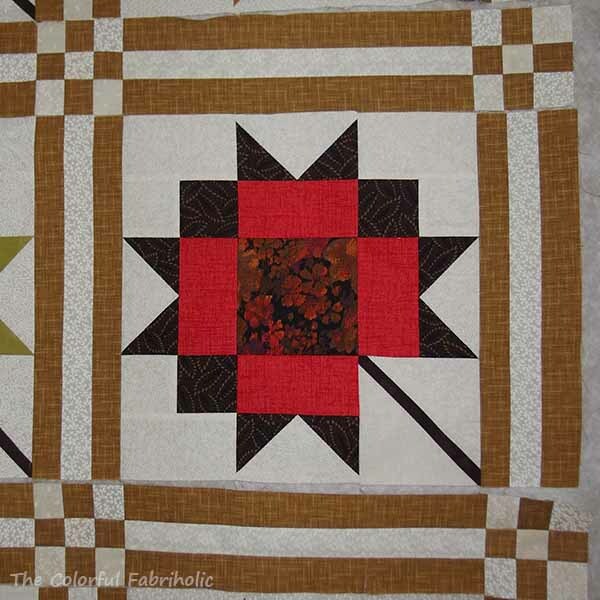 I finished adding the outer border to the Maple Leaf Star blocks this week, so now it's a finished flimsy. This one will have to be added to my longarmer's list; I don't have the skills to do this one justice. 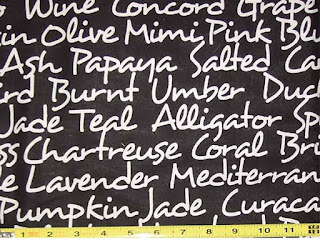 The border print needed to be mitered, and I was able to match the print. All four corners came out well; I'm pleased with them. 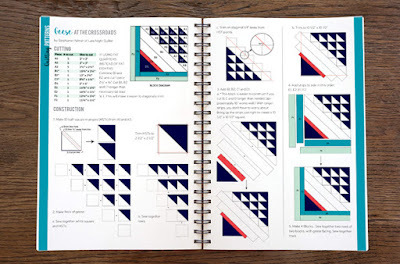 A brief description of how I match the print (or stripe) in mitered borders. No photos, sorry. This process required my full attention and I didn't think to stop and take photos. This works for symmetrical prints and stripes. This assumes you already are familiar with how to attach mitered borders. 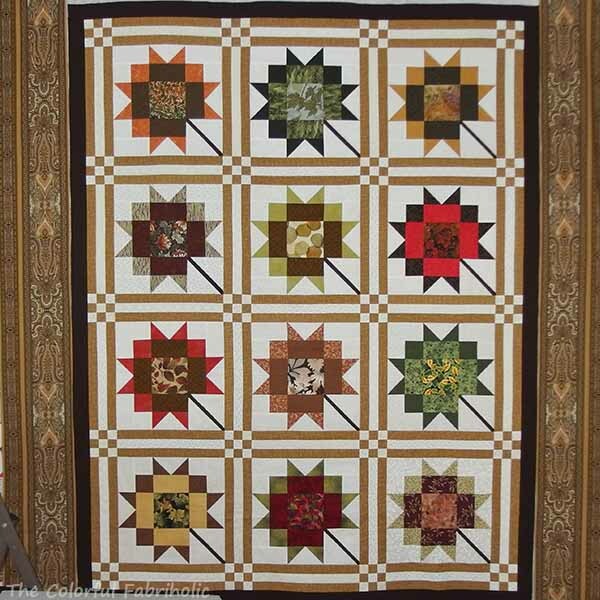 I sewed the long sides on first, matching the center of a print repeat at the center of the quilt. In the photo immediately above, the print is aligned with the bottom visible sashing. Then I laid the equally long cut strips for the top and bottom borders on each corner right sides together and carefully pinned the fabric to match the print, especially the stripey lines. I marked my 45 degree miter seam and pinned some more, to make sure the print matched exactly on my seam line. Basted the miter seam, then when good enough, stitched with a short stitch length. All four corners should come out identical. After I sewed the miters I measured the top & bottom borders from the sides to the quilt's center, and marked both ends of the border at this measurement, with extra border fabric in the middle. Wherever in the repeat the print ended up, I pinned it to make a mirror image match at the center. Again, basted, then sewed the center seam, pressed open, and cut away the excess. 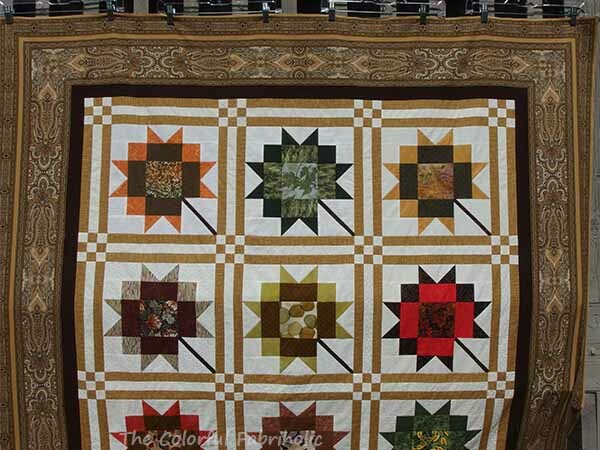 Then finished sewing the top & bottom borders to the quilt. You can see that there isn't a full repeat of the print in the top border in the photo below, but the mirror image match is not objectionable. Top and bottom borders should come out identical. 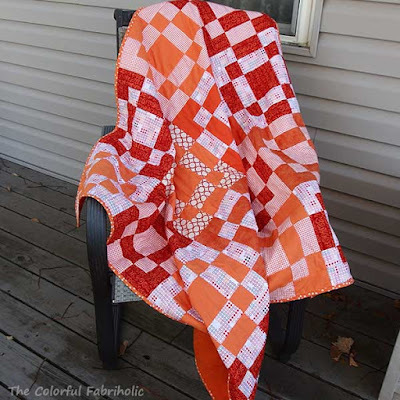 Linking up today with Whoop Whoop Friday at Confessions of a Fabric Addict and Friday Finish at Crazy Mom Quilts. Mitered corner with matched print. Not bad, huh? Let's see if I can make the rest of them come out like this. Oh, and by the way, I ended up keeping the dark brown stop border at 1-1/2" wide. I didn't want it to be the same 1" width as the sashing components, and I was afraid if I went any narrower than 1" that I couldn't keep it looking straight enough when I attached the outer border. My design wall looks a lot like it did last week; I made only a little progress on this top. 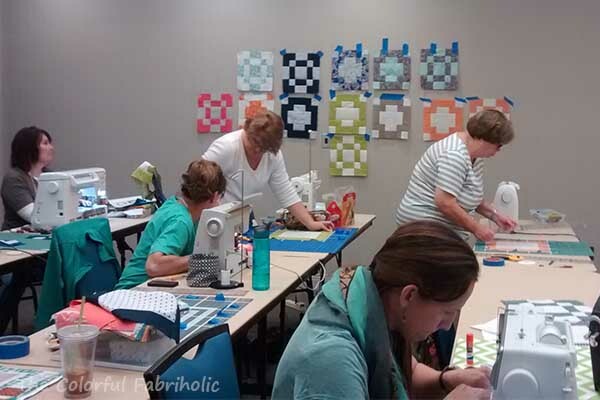 I was able to get the rows together, then plan and cut the border. I have just enough of the border print to miter & match the corners. 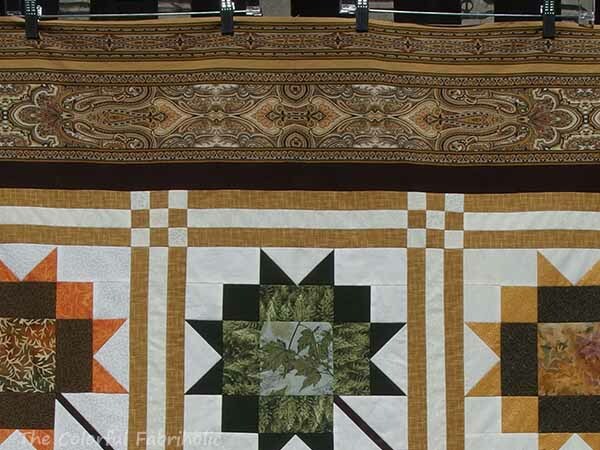 I put the quilt center on the wall with the border fabric, but it needed a dark line to separate the border from the sashing. I found a dark brown like the stems in my stash that will work. The borders are not stitched on yet so I can determine the width of the brown stop border. As is, it would be 1-1/2" wide. I could trim it down to 1" wide like the sashing strips, or I could trim it to 1/2" like the stems. What do you think? I did make other, non-design-wall, progress last week. I got the visual aids for the blocks for my workshop done. I covered three large foam core boards with batting, and mounted the step-outs and demo blocks on them. Surprisingly, that took the better part of a day. I'm glad to have that out of the way with time to spare. On tap for this week: get the borders on this top; make some more Antler Dance blocks; write the outline for my workshop. That should keep me busy! Check out what everyone else is working on at Patchwork Times. 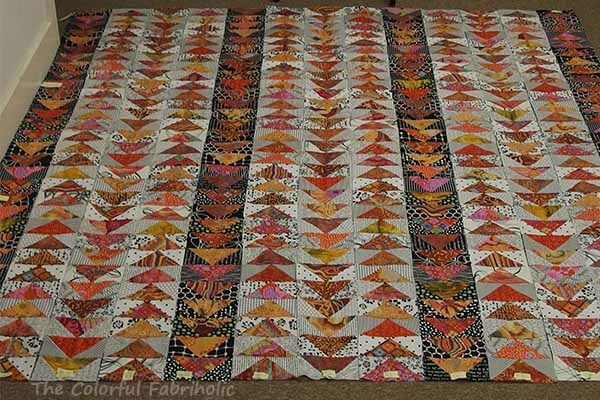 I've been searching for a suitable wide backing for my Kaffe/Batik Flying Geese project for awhile. 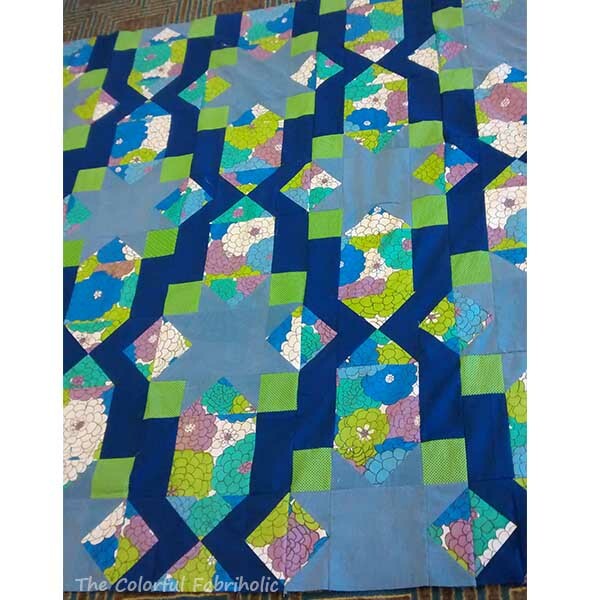 Since it has so many seams and weighs a lot, and since I plan on straight-line quilting this myself, I want a wide backing with no seams. 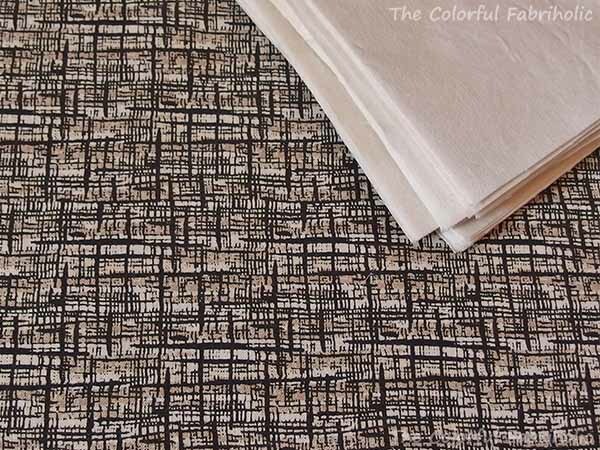 I found the most perfect backing fabric! Ginormous text of color names! 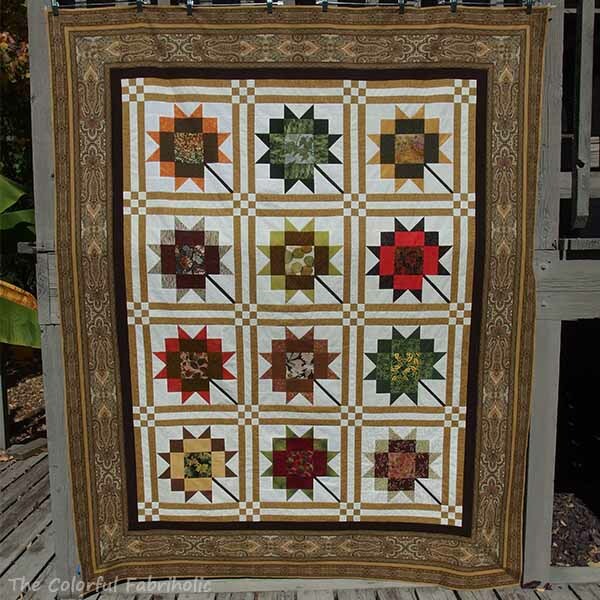 Not only is this ideal for this quilt, but it's perfect for me, too. When I was working, it was part of my job to name colors. 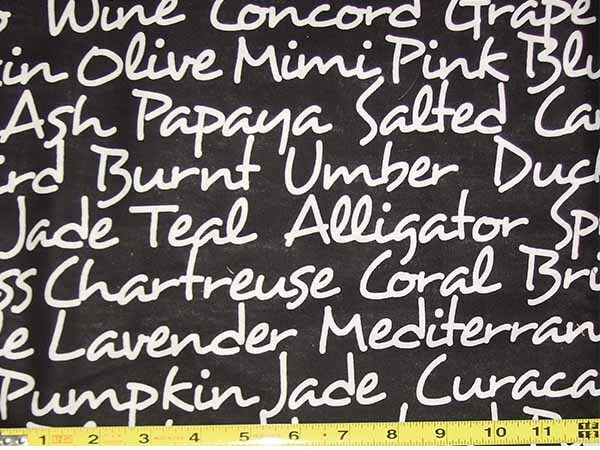 So how cool is this to find fabric with color names?!!! So, 3 yards of wide backing came in this week. Nothing out that I can count. 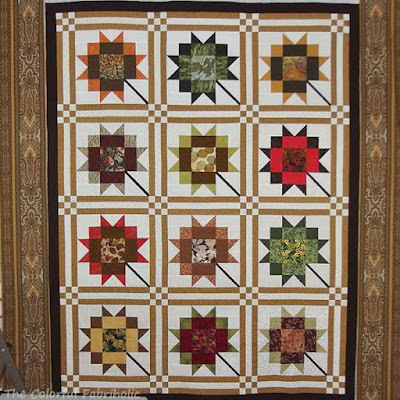 Check out the other stash reports at Patchwork Times and Molli Sparkles. I got lucky - I participated in the 100 Quilts for Kids quilt drive from Heather at Quilts in the Queue and was chosen to win a pattern from Amber Crawley. Amber asked if I'd like a set of her flag/map patterns, or a set of her box patterns, and I chose the boxes. They're so cute. They're English paper pieced. I can see them as gifts or gift card holders, so timely to start making them now for Christmas. I see fussy cutting possibilities.... Thanks, Heather and Amber! And another good thing: I've made progress on a current WIP, Antler Dance. I started making the blocks as teaching samples for my upcoming Cut and Shuffle workshop, and I've kind of kept going, and going. I have almost all of the light blocks finished, and all of the Block Mamas made for the dark blocks. 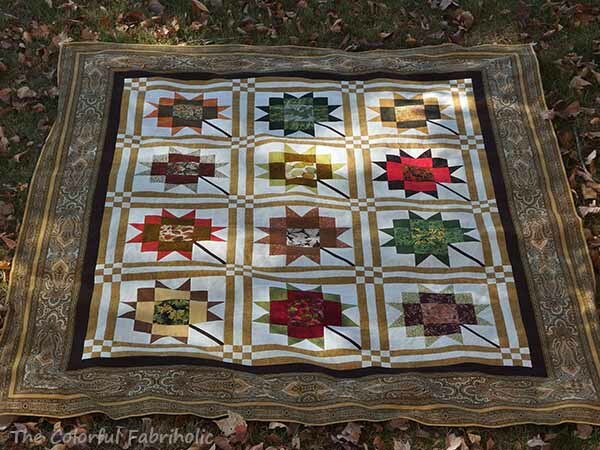 I'm linking up with Freshly Pieced and Sew Fresh Quilts. Check out all the other good things happening over there. One of the blocks really bugged me, which is why I didn't sew the rows together while I was away. Check out the red block, second row on the right in the photo below. You can't miss it. See how all that red just jumps out as one big red blob? I couldn't get past that so I knew I needed to fix it. I replaced the center square with a patch that contrasts better. It's still the brightest block, but now it's much better. I'm much happier with it. 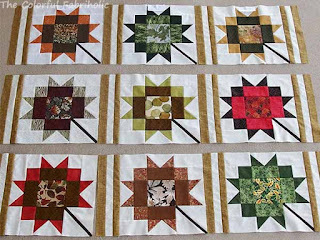 I'm hoping to get these rows sewn together this week and maybe start on the outer border. 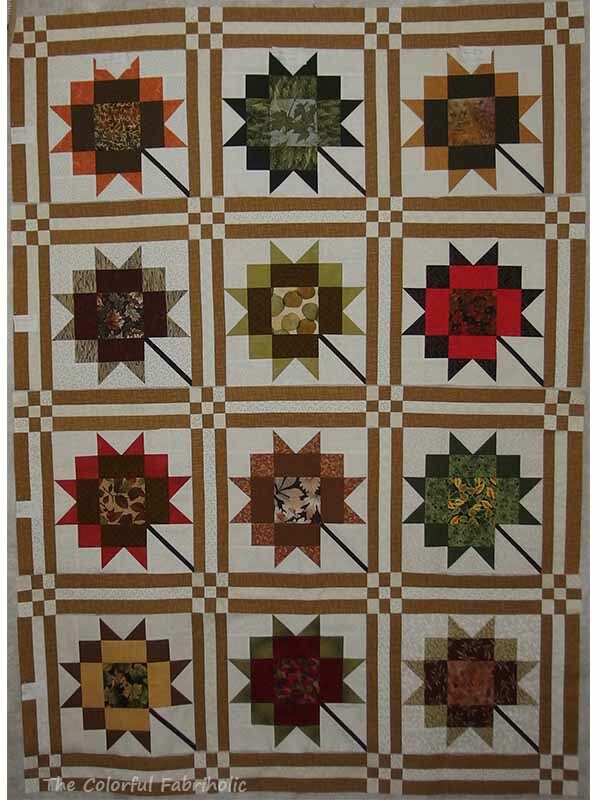 Check out everyone else's design walls over at Patchwork Times. Moving - slightly - in the right direction! I got my Bernina back from being serviced while I was on vacation, and I wanted to try her out and make sure everything's okay. So I made a couple more Wonky Star blocks for Alycia's QOV block drive. 3/8 yard used but I forgot to take a picture. I sent all the blocks out to Alycia so she should get them this week. 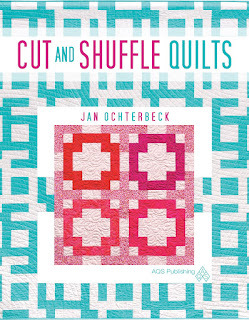 Today I'm excited because my LQS is hosting a book signing featuring moi and my new book Cut and Shuffle Quilts, hot off the presses. Louise, the shop owner, was worried she wouldn't get her books in time; they just arrived late last week. I'm excited but also nervous - I've never done anything like this and I'm not used to being in the spotlight. I admit, it does feel pretty cool, though. Makes all the frustration over the book worth it. I received my books this week. I'm thrilled! 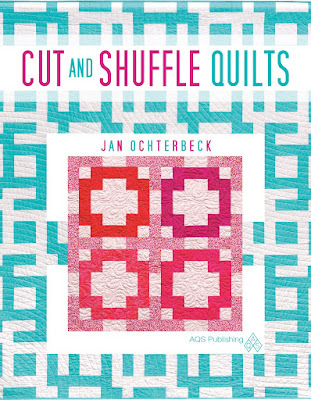 Cut and Shuffle Quilts is available from AQS, Amazon, and -hopefully - your local quilt shop. Start with a simple square called the Block Mama. Cut it into pieces, shuffle the parts, and reassemble them nine-patch style. Create easy, unique blocks with endless creative possibilities! 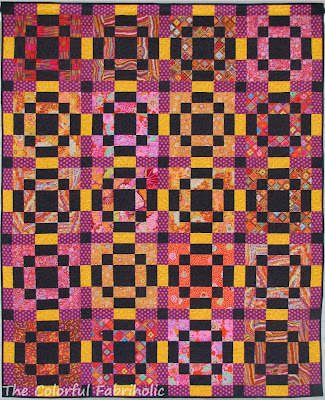 Cut and Shuffle Quilts features the Block Mama, four blocks, and six quilts made with them. Complete instructions are given for the blocks and the quilts. 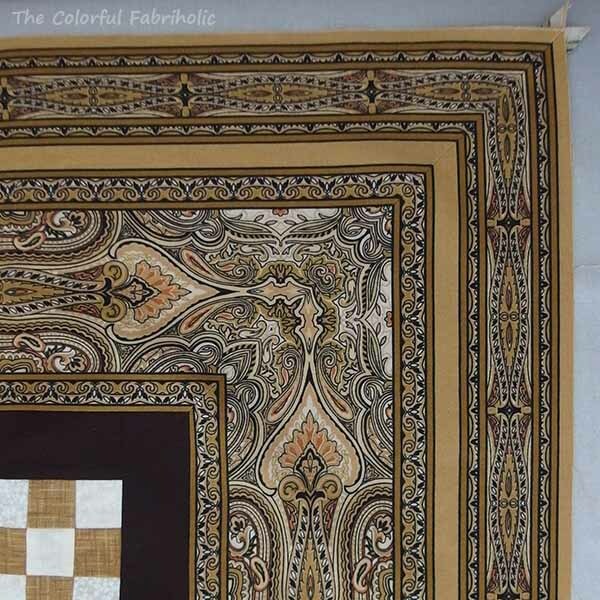 For added creative inspiration, all the quilts are illustrated in additional fabrics and colorways. Cut and shuffle your way to creatively satisfying quilts using the easy Block Mama method. I'm quite pleased with the overall appearance of the book and the graphics. It was a long time coming but now it's all worthwhile! 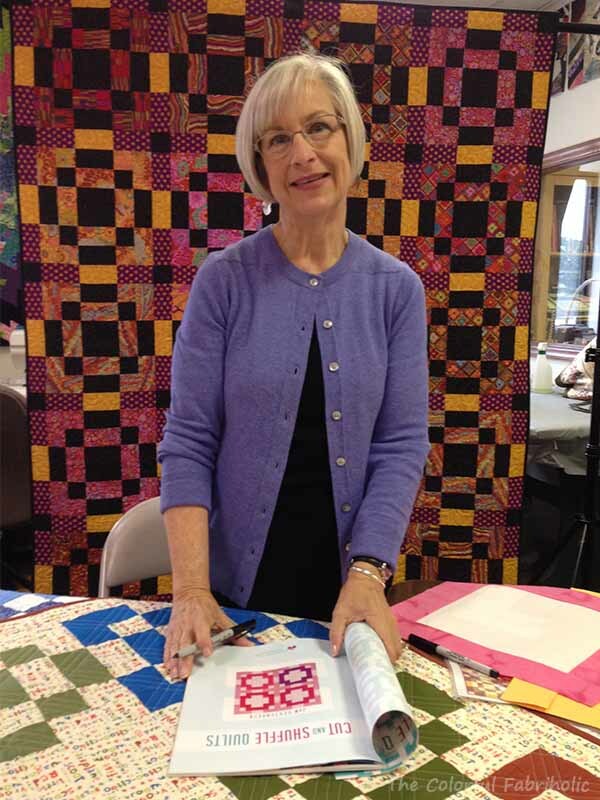 If you're in the St. Louis area, The Quilted Fox is hosting a book signing for me this Sunday from noon to 3. I'll have quilts from the book there, and I'd love to see you there! 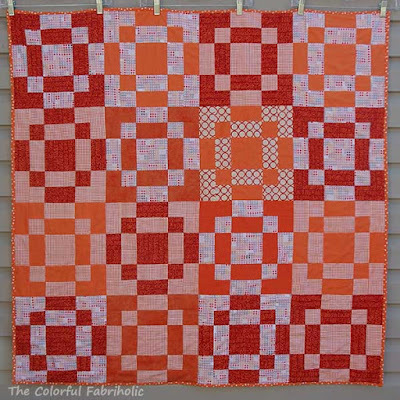 I'm celebrating today with Whoop Whoop Friday over at Confessions of a Fabric Addict. 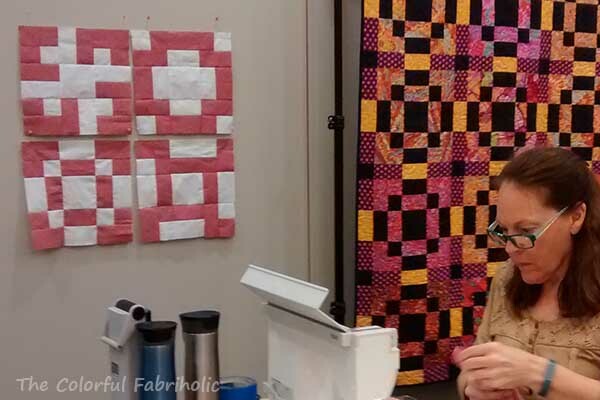 The lovely Sarah will review Cut and Shuffle Quilts in an upcoming episode of her Wednesday book review series. Thank you Sarah! And because it's finally finished and published, I'm linking up with Friday Finish over at Crazy Mom Quilts.